i've been wanting essie's cute as a button forEVA and i finally got it from transdesign not to long ago :D cuz it's the last place you can get cheap essie's online (correct me if i'm wrong please dears). and it truly did not disappoint. 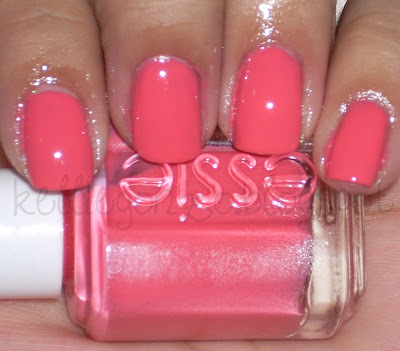 it is a gorgeous pinky coral shade that is so rich and creamy. very complimentary to my skin. it was a tad more orange than i expected. 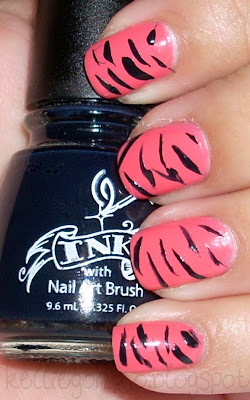 so i figured i would work with it and the second day decided to use my china glaze ink with nail art brush to draw some tiger/zebra stripes. then i thought it looked to pretty or something, haha, so i mattyified it with essie's matte about you, which changes the color up a little and made it even more orange. so i had full blown tiger nails. super fun!